Philosophical pragmatism has aroused renewed interest among philosophers over the past few decades. Its philosophical outlook, which for a long time was regarded either as methodologically weaker than analytic philosophy or as less interesting than various post-structuralist and “postmodern” approaches, is now an almost natural starting point for researchers in the humanities and social sciences. Pragmatism has in recent years attracted a number of Nordic philosophers who are currently working in different fields within philosophy and related subjects. The first Nordic Pragmatism Conference will, for the first time, bring these Nordic philosophers together with both one another and prominent American and European scholars of pragmatism. Its aim is to create a context for further contacts and cooperation among philosophers working on pragmatism both in the Nordic countries and elsewhere. The theme of the conference is the general question concerning both the critical and constructive influence of pragmatism in science, religion, and politics. This allows for a broad and diverse philosophical questioning and discussion between philosophers from different backgrounds and fields of investigation. In addition, attention will be given to the influence of pragmatist philosophy in the Nordic countries. 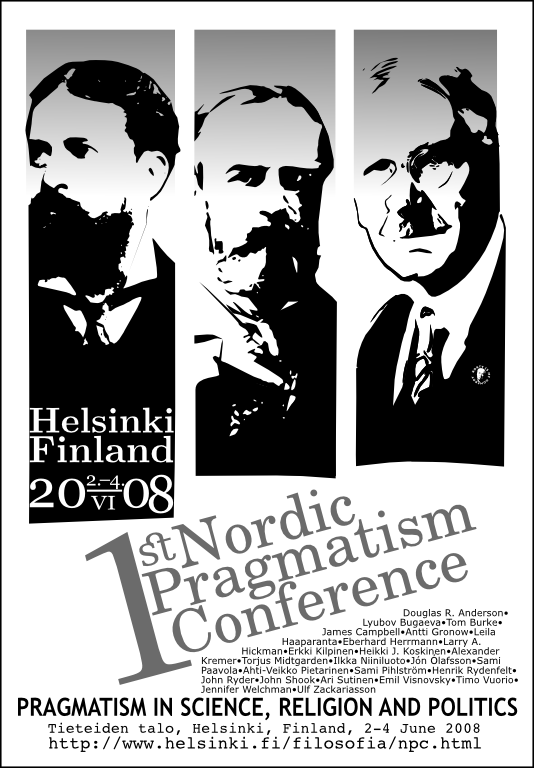 The conference is arranged by the Nordic Pragmatism Network, which was initiated in 2006 to enable cooperation and exchange of ideas among Nordic philosophers working on issues related to pragmatism, and the Philosophical Society of Finland. The conference is sponsored by the Helsinki Peirce Research Centre at the Department of Philosophy at the University of Helsinki, and the Ethical Grounds of Metaphysics research project at the Department of Social Science and Philosophy at the University of Jyväskylä. The conference has been supported by funding from the Academy of Finland and the Emil Aaltonen Foundation. The conference takes place at Tieteiden talo (”House of Sciences and Letters”), Kirkkokatu 6, Helsinki, on 2–4 June 2008. An address-searchable map and route guide of Helsinki is available on-line. Rooms at Hotel Arthur close to the conference location have been reserved for the accommodation of speakers. Registration to the conference will take place at the conference location beginning on Monday, 2 June 2008 at 9.00 am. The registration fee is 30 euros. Please note that we can only accept payment in cash (no checks or credit cards). Invited non-Nordic speakers are exempt of the fee. All participants are, however, asked to register upon arrival. During the afternoon breaks on Monday and Tuesday, complimentary coffee will be served at the cafe of Tieteiden talo. Sandwiches and sweets can be purchased at the cafe. On Monday, 2 June, a reception hosted by the Rector of the University of Helsinki for registered participants of the conference will take place. On Tuesday, 3 June, there is a conference dinner at restaurant Kaisaniemi (Kaisaniemenkatu 6), near Hotel Arthur. Participants will meet at the lobby of Hotel Arthur at 6:30 pm. All Nordic participants are kindly asked to make their reservation when registering to the conference on Monday, 2 June. The dinner costs 50 euros (cash payment at registration only). Living a Tradition: Pragmatists’ Bequest. My central thesis is that so-called “new pragmatism” or “neo-pragmatism” does not operate with the philosophical attitude bequeathed by the early pragmatists. I do not aim to argue about who owns the name “pragmatism.” My point will simply be to suggest that if one wishes to work in a “living” tradition with the original pragmatists, one must take a different approach to philosophical practice than that embraced by the post-analytic pragmatists. I will close with a few remarks about the consequences of engaging in philosophy in these differently “pragmatic” ways. To discuss pragmatism in science, religion, politics, or any other such vital endeavor, it is worthwhile first to square away what is meant by “pragmatism” in some generic sense. The latter, of course, is a long-standing, contentious issue. In this paper I want to promote one simple criterion: namely, a pragmatist philosophy must essentially and substantively endorse the pragmatic maxim. For better or worse, this lone criterion casts the pragmatist net rather widely. The constraints it imposes are not on what one thinks but on how one thinks it. The aim of this conference is to explore applications of pragmatist thought in science, religion, and politics. If indeed pragmatism is not a single philosophy, such applications will not be a matter of applying a single pragmatist doctrine. I will instead focus on how the pragmatic maxim can affect such applications by placing specific constraints on language and logic as the means by which we think about vital matters. Thus I want to stress that the pragmatic maxim not only casts a wide net but one that is also able to trawl at great depth, reaching to the core nature of logic itself. This paper explores three strands within the Pragmatic understanding of religion. The first is the emphasis of William James (1842-1910) upon religious experience as the highest form of human experiencing, and his de-emphasis on both religious dogmas and organizations. Next to be considered is the religious thought of James Hayden Tufts (1862-1942), especially his discussions of the importance of the ongoing reconstruction of religious practices and symbols. The final strand is the position of John Dewey (1859-1952) on ‘religious’ as an adjective, and his emphasis upon improving the shared life of the community. A better understanding of these strands will contribute to a fuller understanding of both Pragmatism and religion. Societal development is frequently measured in terms of comparing the Gross National Product (GNP) of different nations. Amartya Sen has argued that the GNP is actually too gross because it does not tell us anything about the distribution of wealth and, more importantly, it does not take into account the differing needs of individual people. Therefore Sen has suggested that we should look at the realisation of people’s capabilities as indicators of social development. Capabilities are human functionings that belong to basic freedoms. The exact definition of capabilities, however, is the task of public discussion. Sen’s important argument unfortunately leads to difficulties that are three-fold: he lays emphasis on the importance of active agency but his theory of action is too passive; the problem of relativism rears its ugly head; and lastly, Sen’s discussion lacks also an adequate understanding of the public sphere. I maintain that these problems can be fruitfully encountered with the help of pragmatist social theory. Pragmatism highlights the centrality of action in a manner that supplements Sen’s emphasis on active agency. Second, relativism is not an issue for pragmatism because of its naturalist starting point. Nevertheless, human beings are affected by their social environment; in fact, it enables proper self-hood and agency. In addition, with John Dewey’s theory of the public we can envision the deliberation of capabilities as a reflexive, self-corrective process. This paper starts with the idea that religious belief is trust in God; as trust, it cannot be reduced to a propositional belief-attitude. Hence, one’s belief in God is not of the same type as one’s belief that there is a being of a certain kind. We want to ask, however, whether religious belief, as belief in something, nevertheless presupposes belief also in the sense of a propositional attitude, or belief that a certain kind of being really exists, independently of the believer and her attitudes. Although some of our claims might be applicable to other religions as well, we restrict our attention to Christianity. In this paper, we have a hermeneutic aim. That is, we want to understand religious belief in its own terms and not in those of a naturalistic, scientific, or some other type of non-religious world view. The key idea is that what we say on the matter should give a voice to the believer. This implies that for any given philosophical analysis of religious belief, a crucial criterion of adequacy is that it should also be able to function as an instrument of genuine self-understanding for the believer herself. We focus on the concepts of disbelief and doubting belief. By analyzing them, we try to indirectly clarify the nature of religious belief. Because our analysis results in the unavoidability of the ontology of distinct persons in the form of God and the believer, we argue that the notions of truth and existence also have an indispensable role in religious belief. In connection with spirituality, we point out that another reason why religious belief is not only a static propositional attitude is that it has to do with the active and dynamic practice of religion. In the Christian tradition, these practices are intimately connected with ethics and liturgics. Truth and existence have a central role also in practices like prayer and meditation, because these are based on a certain metaphysical framework as they reach towards the transcendent. In this paper, we will look at the relevant issues through pragmatists like Peirce and James, and argue that while various individual and social practices have an important epistemic role for religious belief, its metaphysics cannot be seen as dependent on those practices. In this paper I will question metaphysical realist conceptions of truth which disregard the fact that truth claims are always raised by certain people in certain contexts, as well as post-modern conceptions of truth which regard truth as relative and not objective. Neither kind of conception enables us to uphold the distinction between what is conceived of as being true and what actually is true. A reasonable conception of truth, therefore, must defend the objectivity of truth, but by taking into account that truth manifests itself differently in different life practices. For instance, religions and their secular counterparts, as well as the sciences, are such different kinds of practices, with different functions in life, in which we learn to distinguish between true and false in different ways. Despite their different functions, the different practices are part of the way in which we relate to reality in order to be able to live a good life. There is no consensus on what constitutes the good life, but we all know that a life in poverty, misery, violence, marginalisation and oppression is definitely not a good life. Whereas religions and their secular counterparts provide us with conceptualisations of the experienced tension between what life at its best could be like and the reality of how flawed life actually is, the sciences provide us with knowledge of how reality operates and thus of the practical conditions of, and hindrances to, a good life. Without this division of labour between science and religion, it is not possible to formulate a balanced critique of either. The antireligious critique based on so-called scientism is not reasonable since it disregards the fact that science as such cannot answer existential and moral questions. For that we need religious or secular images and narratives which provide conceptualisations of how reality offers resistance existentially. However, the critique directed at the theory of evolution by creationists and advocates of the theory of intelligent design is not reasonable, either. Religious belief is not empirically testable nor does it lead to empirically testable hypotheses. Instead, religions and their secular counterparts provide us with self-reflective insights into what it means to be a human being. Finally, against this background I want to argue that instead of freedom of religion, we ought to aim for freedom of way of life, a freedom which builds on everybody’s right to a good life. Critics of Pragmatism who have faulted its alleged truth deflationism seem to have hit their mark with respect to some strands of neopragmatism. But it is important to understand that neither William James nor John Dewey was a truth deflationist in the current sense of the term. Both James and Dewey were fallibilists, and both rejected Platonist, a priorist, and other traditional notions of truth that they identified with “intellectualism.” They nevertheless developed and maintained robust notions of truth that are grounded in the experimental sciences and that have important implications for current social and political issues. All prominent pragmatists, from Charles Peirce to Richard Rorty, and almost all of their commentators, have agreed about one thing. Pragmatism does not begin from epistemology, the theory of knowledge, as philosophical programmes normally do, and this is what outsiders often have found suspicious if not bizarre. It has also been said that pragmatism favours action at the expense of knowledge. So it actually does, but it has a reason for this, its basic ontological assumption which depicts the world as an irregular process rather than as a steady surrounding. From this stems also another curiosity, namely that pragmatism prefers to talk about “habit” rather than “action” pure and simple. The former notion, it will be explained, is more general than the latter in a positive sense, so that nothing that is valuable in the traditional action-conception needs to be sacrificed. Compared, for instance, with critical realism, pragmatism is severely underutilized in social sciences. Whereas realists bring out the importance of the ontology of a realist origin, pragmatists emphasize their understanding of practice and action. As thoroughly relational and action centered pragmatism is apt for enhancing methodological thinking in for social sciences. I myself have been developing a pragmatist version of methodological relationalism (Kivinen 2006; Kivinen & Piiroinen 2006, 2007; Kivinen & Ristelä 2001). Surely in social sciences there are several pragmatic-relational approaches (see Emirbayer 1997; Fuchs 2001; Somers 1998) and even Pierre Bourdieu has occasionally identified his approach as methodological relationalism (Bourdieu & Wacquant 1992), but from pragmatist point of view all those approaches need some methodological fine tuning. A representational metaphor of mirroring reality is not fruitful in inquiry; beliefs and concepts can not be pictures of reality. As Peirce put it, a belief is a habit of action. Beliefs, concepts, words and symbols, i.e. languages, are tools of human communication when people are coordinating their actions to cope with their environment and in order to reach their purposes. Beliefs are the same as hands: instruments for coping (Menand 2001). Pace Searle (2001), the social sciences do not need any kind of social ontology. An object of inquiry becomes conceivable only when it is intentionally described in a languge game. In a Deweyan vein, in research framework, theories become understandable in terms of acts to be done and concepts have to be operationalized into research actions serving empirical analysis. Actually, research is systematic doubt, empirical trial and experimentation for getting answers into research questions; research is not about revealing ultimate reality, but answering human problems. As Dewey says, cognitive certainty is integrated with the need to guarantee the results of actions, not connected with metaphysical truths. Life is organism’s transaction with its environment. Habits can be understood as dispositions that are being actualized in different organism-environment transactions. Habituality and creativity are intertwined in human action (Joas). A belief as ‘a habit of action’ insight implies that all anyone can have is one’s actor’s point of view on anything. Inquiry is no exception. As Dewey put it, no event comes to us labeled as cause of effect and also all causes are causes seen from actor’s point of view (James). Social sciences focus on social action that leans on individual habits and customs of social communities. In their action people have to take into account the causal relations and pressures of the outside world. People can not act and use language more arbitrarily than the environment allows (Davidson, Rorty). Concepts, like any other tools of action, are entangled in causal relationships with the rest of the world. In my paper I will analyze first of all Rorty’s neopragmatist view of science comparing it to Dewey’s views. In the second part I interpret his descriptions about religion comparing to James’ views. Finally I will show his liberal ironic standpoint in connection with politics where he had an idea of a liberal utopia and a new concept of solidarity, but it is out of question that he was a keen supporter of the liberal democracy. In interpreting the semantics of classical pragmatism Robert Brandom introduces several distinctions. Firstly, he generally distinguishes any pragmatist semantics through its order of explanation: namely to account for conceptual content in terms of practices of using concepts. Secondly, he distinguishes the semantics of classical pragmatism in particular through a semantic tactics and a more general semantic strategy; while the tactics represents a stereotype version of pragmatism as an instrumentalist semantics (accounting for the contents of beliefs in terms of success), a functionalistic strategy accounts for content in terms of experience and learning as adaptive and cyclical organism-environment processes and activities. What is left out in this story, however, are the ways in which Dewey accounts for meaning in terms of social practice. In this paper I will try to show how Dewey’s pragmatist semantics differs from that of Brandom through its distinct way of analysing what a social practice is. The paper explores pragmatist attitudes to radical action, activism and to some extent anarchism. Dewey’s philosophy is the main inspiration for this exploration, and it will be argued that pragmatist philosophy in general and Dewey’s philosophy in particular provide a remarkable account of radical action where radicalism is seen as a necessary part of main stream politics rather than necessarily marginalised and excluded from the main stream. Pragmatist criticism of what we may call enlightenment politics can be explained from this point of view. Pluralism about values entails a commitment to multiple discourses whihc makes the idea of a basic consensus problematic. Nowadays such conception of practice is often emphasized which, instead of focusing on iterative or habitual routines, takes also dynamic and creative aspects as well as potential to change fully into account (see e.g. Kilpinen 2000; Miettinen & Virkkunen 2005). Knorr-Cetina (2001) has called these kinds of practices ‘epistemic practices’ which characterize knowledge-centered activities and work. Epistemic practices are related to “epistemic objects” which are open-ended, future oriented, and in the process of being defined, like scientific objects of investigation (see Rheinberger 1997), not fixed routines or objects with stable properties. I will analyze different approaches to understanding and analyzing epistemic practices, like cultural historical activity theory and Peirce’s pragmatism with phenomenological categories. The notion of epistemic practices helps to understand modern knowledge work especially in research teams where practices are regularly and collaboratively reflected. But what is meant in more concrete terms with ‘epistemic practices’? The aim is to give some examples of conceptualizing epistemic practices, in order to see how they mediate between routines and innovation, between explication and non-explication, or between cultural and situated practices. From the point of view of contemporary logic, early attacks on formal logic by the pragmatist philosophers, most notably by F.C.S. Schiller, are little more than archaic aspirations to the priority ordinary language should have in philosophy. On the other hand, the point was also to defend a wider concept of logic; something Charles Peirce approved. But though agreeing with Schiller that philosophy, as far as it analyses “vague ideas of ordinary life” and should indeed use “a body of words with vague significance” (MS 280, 1905), Peirce thought that philosophy should clothe itself in a vocabulary of its own. He conceived abundance of notions of logics not merely to have a toolkit at hand for a variety of technical purposes but in order to have the means by which the meanings of the expressions with vague significations can be made more precise. Logic thus does not concern primarily with the usage of language but with the nature of ideas. It has to take precedence over metaphysics lest the speculation flow free in the boundless realm of philosophical thought. While some pragmatists, including William James, appreciated Peirce’s arguments against Schiller to a degree, I will argue that the neglect of the logical roots of pragmatism in contemporary debates is an instance of the symptom of taking language as a universal medium of expression. I argue that these two presuppositions concerning the nature of language and the role of logical inquiry in pragmatistic philosophy enable us to delineate two major kinds of pragmatisms. This paper discusses the reception of the pragmatist tradition in the Nordic countries, primarily Sweden and Finland. The first translations of and commentaries on William James’s pragmatist works, in particular, appeared relatively early both in Sweden and in Finland. For example, Malte Jacobsson’s 1910 book on pragmatism, as well as Eino Kaila’s early (1912) writings on James introduced pragmatist themes into Scandinavian philosophy. However, pragmatism has, obviously, never been a major philosophical movement in any of the Scandinavian countries. In Finland, philosophers have traditionally been relatively active in commenting on public issues in the media; whether this in some sense amounts to a “pragmatist” conception of the relevance of philosophical reflection deserves critical discussion. Charles S. Peirce famously argued that the aim of inquiry is belief. Whatever we may fancy, the aim of inquiry is not truth in any substantive, interesting sense. While it is oftentimes difficult to see what unites different philosophical views advanced under the title of pragmatism, I would like to suggest that at least here all pragmatists from Peirce to the likes of Richard Rorty are in accord. As pragmatist philosophers have turned away from abstractions, the roles beliefs and the notion of truth play in our practical lives and inquiries have become a natural starting point. Accordingly, many pragmatists have opted to call true those beliefs that ultimately satisfy our cognitive desiderata, often pointing out that they must also keep doing so in the long run. But such talk about satisfying what we want of our beliefs brings to the fore a set of interesting questions. Namely, what are our cognitive desiderata? How are we supposed to know our cognitive desiderata are such as they should be? In this paper, I will compare the answers to such questions given by Peirce and James. Consideration of this issue, I hope, may open a perspective from which to locate both some basic agreements and two key differences between the two first pragmatists – differences that have made a difference in the development of later pragmatist philosophies. Much of what is referred to as philosophical naturalism today, because of its focus on science or epistemology, tends to ignore the question of religion. Classical American Naturalism, on the contrary, tended to regard religion as a dimension of human experience that could not simply be dismissed. We will consider the two primary ways in which religious experience, and the concept of God, were handled. In one case, George Santayana tended to shift the experiential significance from religious to aesthetic categories. In the second case, John Herman Randall, Jr. and Justus Buchler developed a relational, pluralistic ontology that dealt with God and religion in creative and philosophically interesting ways. After describing these two approaches in the classical literature we will offer an argument for the continued plausibility of both approaches. Pragmatic Naturalism depends on scientific realism, because excessive skepticism towards science’s best theories undermines any serious naturalism. Because pragmatism is a special type of empiricism, pragmatic naturalism must resolve the tension between empiricism’s capacity for skepticism about scientific theories establishing their truth and naturalism’s confidence in scientific method discerning reality’s structures. Pragmatism’s perspectivalism, pluralism, and fallibilism does support a modest scientific realism that is capable of grounding the best kind of naturalism. The aim of my paper is to reconstruct George Herbert Mead’s and John Dewey’s philosophy of subjectivity and its relationship to democracy. The above-mentioned classics in pragmatism have a three-step theory of subjectivity. These three steps, or states, are the emotional state, aesthetic state and reflective thinking. An individual’s growth process starts in the emotional state, when spontaneous action and resistance in the environment produces experiences and emotions in the individual. In the aesthetic state, when the individual’s experience is transformed into language in interpretation through his/her own thinking, the individual can create an aesthetic object, a symbol or a word. An aesthetic object that means something to the individual makes his or her thinking possible. The aesthetic object is always produced in social action, but subjectivity is needed to understand a social situation in which an aesthetic object, a symbol is produced. Reflective thinking begins when the individual has enough symbols or words to use them in thinking to create new solutions to problems encountered in his or her action. In this third state, individuals can also solve problems in society, which means democracy. The paper shall basically attempt at the following goals: (1) To reconstruct the main strands of the conception of normativity as outlined in the classical pragmatism, (2) To reconsider the current neopragmatist approaches to normativity, (3) To compare the pragmatist approach to normativity (in particular to social norms) with other non- pragmatist conceptions. Such an analysis aims at exploring the key merits of the pragmatist social theory. Those who find Richard Rorty’s neo-pragmatism plausible, and share his antirepresentationalism, seem to face an dilemma as far as cultural respect for science is concerned. This can be put, as Björn T. Ramberg recently did, how a pragmatist can be fond of science but not that of metaphysics? It looks like Rorty’s own solution that the exemplary role of science can be explained solely in terms of solidarity is not good enough. In my paper I will propose one solution to ’Rorty’s dilemma’; taking the relation of science into technology into concern. Larry A. Hickman is the pioneer in this field, but my sketch of pragmatist philosophy of technology is based on Rorty’s metaphilosophical insights. By swifting the attention from the mirror-like-nature of science into technological world of contingencies, and seeing the latter as primary to the former, one could redescribe the problematic ’human-world’-relation in thoroughly pragmatic terms. This solution, I will argue, will satisfy the antirepresentationalist demands. Some environmental philosophers argue that Western value theories must be reformed because they do not assign nature a value independent of human interests, wants, or experiences. This is essential, they argue, if we are to find adequate moral grounds to require people to protect nature. To a pragmatist, this approach looks badly mistaken because (1) it assumes there can be values without valuers and (2) it ignores the actual values people realize through nature. A pragmatist would argue that the problem with past environmental policies was not that they promoted human values but that they promoted too narrow a range of the plurality of values humans actually realize through natural entities (e.g., economic at the expense of aesthetic, scientific, moral, cultural/historical, and spiritual, etc.). Since these constitute a genuine plurality, we cannot justify maximizing one at the expense of others; a more modest ‘satisfying’ strategy is required. For example, we might reconceive nature as a kind of ‘public good’ to which the most equitable access possible should be assured, compatible with preventing the irrevocable loss of any one source of natural value. One of the central, but often neglected, questions of philosophy of religion is how to conceive of religion for philosophical purposes. In Anglo-Saxon philosophy of religion, the battle has mainly been fought between mainstream philosophers of religion on the one hand, and Wittgenstein-inspired philosophers of religion on the other. Both sides claim that the opponents distort religious belief. Mainstream philosophers of religion accuse philosophers like D.Z. Phillips of disregarding religious believers’ self-understanding of religion, and thus presenting normative, not descriptive, conceptions of religion. Phillips retorts that it is mainstream philosophy of religion that distorts religious belief by conceiving of it as similar to scientific hypotheses. Pragmatic contributions to philosophy of religion have been comparatively rare (despite the interest in pragmatism in modern Theology). Pragmatists face the same risk as Wittgensteinians of becoming marginalized already from the outset by the accusation of distorting religious belief from mainstream philosophy of religion. In this paper, I briefly present a pragmatic approach to religion and views of life, where views of life are considered as systems of funded meanings drawn on in interaction with the environment. The function of views of life is, on this view, to help us establish an equilibrium with the environment, and to give us the resources to restore it in a satisfactory manner whenever it is upset. Then I go on to raise the question: can we meaningfully argue for and against different conceptions of religion, despite the fact that we operate with rather different philosophical presuppositions? After considering some possible routes to meaningful debate, I conclude that debate between different conceptions of religion may be possible. However, such a debate requires that we avoid the tendency of conceiving of religion and views of life as isolated practices that function according to their own standards, or self-understanding. Although such approaches have been most popular among critics of mainstream philosophy of religion, they have, I believe, served to strengthen rather than weaken mainstream philosophy of religion. Instead, I argue that we need to stress the interrelatedness of human practices, and that they must also be understood and assessed in terms of a more comprehensive goal, which I propose we label human flourishing. I conclude with some remarks on what this implies for pragmatic conceptions of religion and pragmatic philosophy of religion generally.